There are occasions when you are managing content and often think &apos;this would be worthwhile having in a different project&apos;. Normally at that stage you would need to re-upload the media but not with Aframe. This feature give account & organisational administrators the ability to move content from one project to another. Note: This feature is not available to the level of project administrators or below. Choosing this feature from within either of the above locations will give you the same experience. Clicking on the button will launch a window with further options Here you can select the chosen target project and which markers (if any) you would like to be included in the copy. 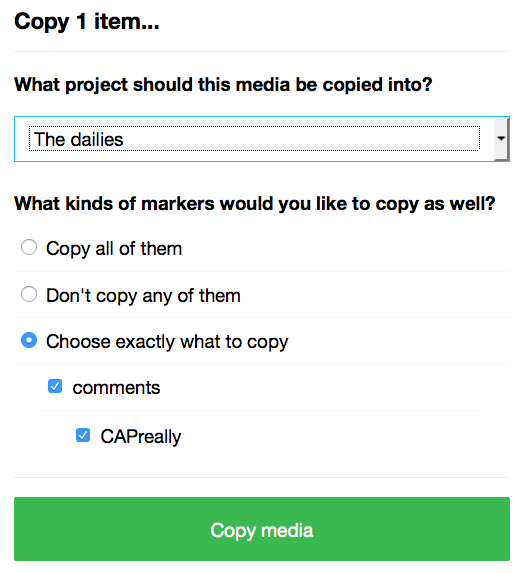 Once you have selected the big green &apos;copy media&apos; button, you will see a message of confirmation across the top of the screen. When you copy media between projects, you are not creating a new file and thus not adding to your storage. In this initial release, we do not support copying between projects that are stored on different server locations. You cannot, for example, copy media from a project stored on London, into a project stored in New York. You are unable to copy camera card media in this initial release.